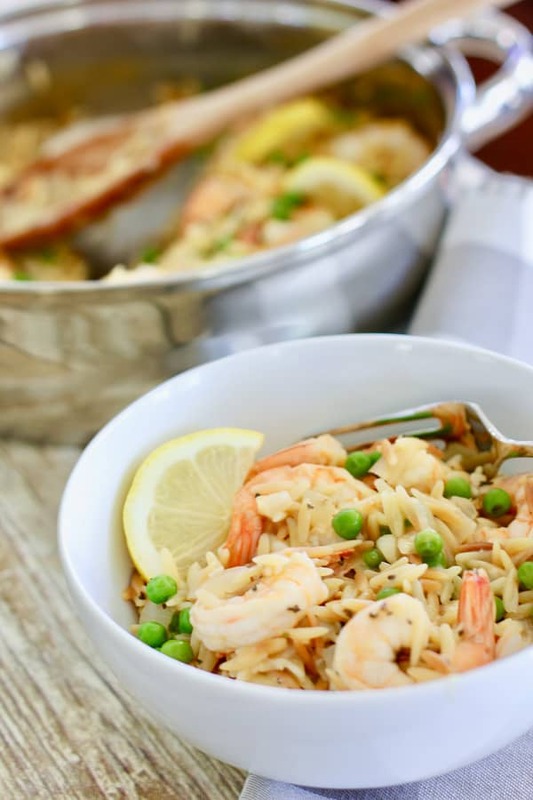 In just a few minutes you can serve up this comforting delicious Shrimp and Orzo Dinner and better yet, do it all in one pan! Simply prepared and bursting with fresh flavor, we love this one pot wonder! Tender shrimp with easy and fast cooking orzo pasta. Fast, fresh and healthy just the way we like it around here! Well hello fast and fresh dinner! This beautiful one pan meal is ready in…wait for it… 20 MINUTES! Ready, set, go and dinner is done! Besides being easy and quick, this recipe is also healthy. Shrimp is very low calorie and orzo is like baby pasta, so it must have only half the calories of regular pasta right? Orzo is simply pasta that’s shaped like rice! It tastes like pasta with a nice chewy texture. It’s small and cooks up quick so it’s perfect for one pot dinners! 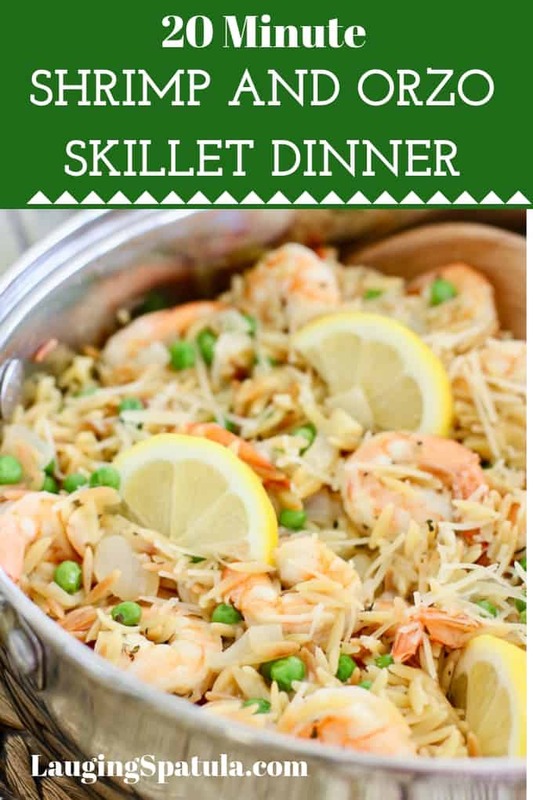 How Do I Make This 20 Minute Shrimp and Orzo Skillet Dinner? Check out the video below and see how easy this dish is to make! Start with a little chopped onion, fresh garlic and a bit of olive oil along with your orzo. While your onion and garlic are cooking your orzo is toasting! Next, add your chicken stock. Can I add a bit of cream? You bet! Simply sub 1/3 of the chicken stock with cream or half and half and you have Creamy 20 Minute Shrimp and Orzo Dinner! We used ‘tail-on’ shrimp because I think it looks pretty…but rumor has it it can be annoying to pluck the tails off while eating. I like to think of it as a ‘dinner activity’. You can buy ‘no tail’ shrimp as well. These are medium size 31-40 per pound. Once your shrimp is pink and the peas are cooked through, add a big squeeze of lemon, a handful of parmesan cheese and TASTE FOR SALT AND PEPPER…this is the step even good cooks forget. I am a notorious under salter! My family doesn’t like peas…well at least one of them :). Got any substitute ideas? This recipe works great with just about any fresh vegetable. Broccoli, corn, asparagus just to name a few. Simply stir them in in place of the peas and cook until crisp tender. Can I substitute chicken for the shrimp? Yes, yes and yes! Before beginning your onion orzo mixture, cube boneless chicken into 1-2 inch pieces. Sear for a couple minutes in a little olive oil until almost cooked through. Set aside. Then add back to the skillet in place of the shrimp. 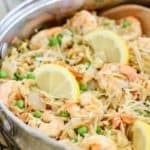 What are other tips to make this Shrimp and Orzo Skillet? Use raw shrimp. Medium. 31-40 per pound. Tail or no tail…depends on if you don’t mind removing them while dining. I kinda like it. Food weirdo. Don’t like peas? Substitute broccoli or asparagus for the frozen peas (or use both and veggie it way up!). Substitute feta for the parmesan for a Greek spin. Great for lunch the next day, cold or warm, and stays fresh in the fridge for a couple days. We have about a dozen orzo recipes…it’s our fave pasta! You can see them all HERE!Check out our one pan Chicken and Orzo Skillet – another super fast and fresh one pot meal and our Lemon Orzo Soup recipe, so fresh tasting, perfect for spring or winter! To fast, fresh and flavorful dinners that go boom! 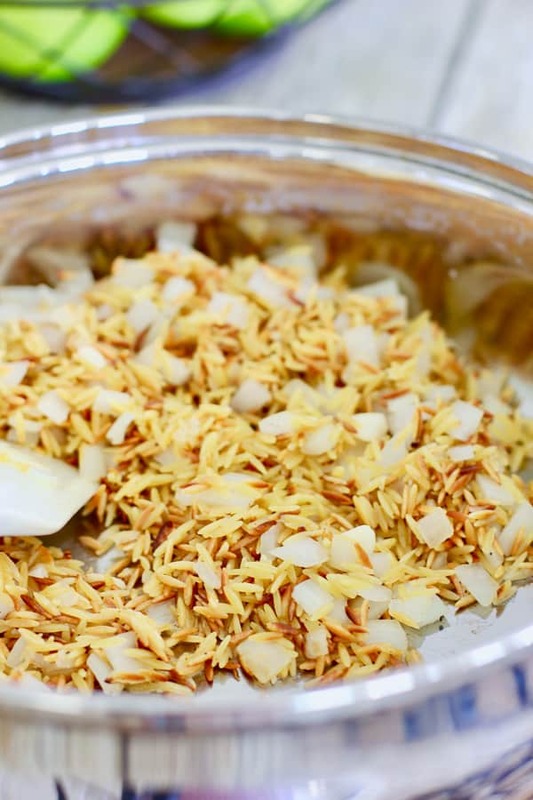 Check out this video on how to make this Shrimp and Orzo Dinner perfectly! 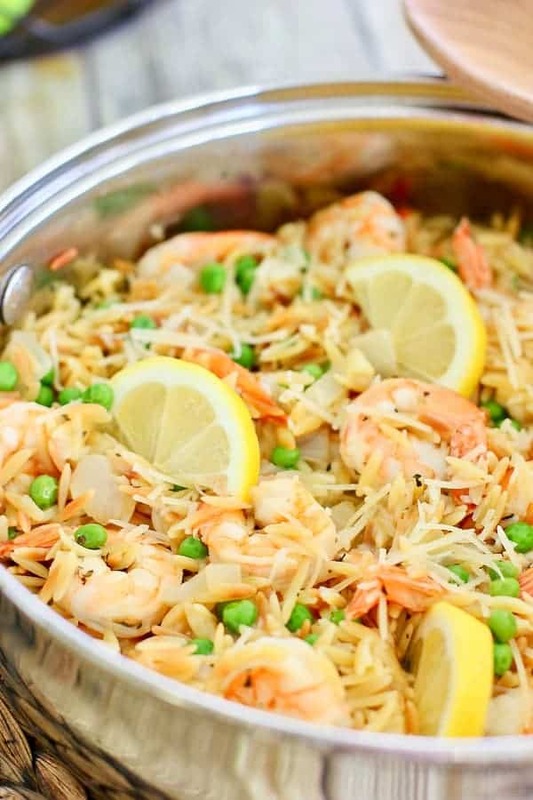 This Shrimp and Orzo one pan meal cooks up quickly in a broth based sauce. Add any or all of your favorite veggies to make it different every time! Heat large skillet to medium high heat. Add butter and olive oil. Heat until butter is melted. Add onion, garlic and orzo. Cook for 3-4 minutes until onion is translucent and orzo is slightly toasted. Reduce heat to medium. Cover and cook for about 10 minutes, stirring occasionally, until orzo is soft and just a small amount of liquid remains in the pan. 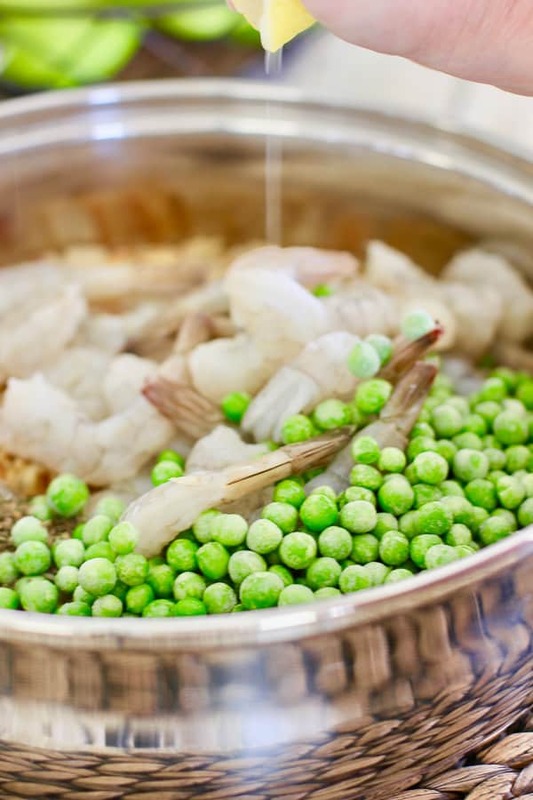 Toss in the shrimp, lemon juice, peas and basil. Stir and cook for an additional 5-6 minutes or until shrimp is cooked through and peas are warm. Add 1/2 cup grated parmesan, stir until combined. Garnish with lemon slices and additional grated parmesan. See the video for an easy tutorial. NOTES To Make Shrimp and Orzo Skillet: Use raw shrimp. Medium. 21-25 count. Tail or no tail...depends on if you don't mind removing them while dining. I kinda like it. Food weirdo.Substitute broccoli or asparagus for the frozen peas or use both and veggie it way up!Substitute feta for the parmesan.Great for lunch the next day, cold or warm, and stays fresh in the fridge for a couple days. Yummy! I think I could eat anything with Orzo 🙂 The shrimp, peas, and lemon were the perfect combo. Thanks for the note Anna! We are so glad you liked it! Thank you Stella! I love this dish and still make it on a regular basis! I made this last nite and it was delicious. Very easy to make. Made this today. Very easy and it was delicious! Thank you! I am so glad you liked it! I just made it last week :). Family fave! I made this for dinner tonight and it was very tasty and easy! Hi Cindy! I am so glad you liked it, thank you so much for taking the time to comment! I added Zucchini, asparagus and no peas.then 1/2 cup of white wine. it was excellent. Oh this looks absolutely divine and like the perfect throw together weekday meal! I make a shrimp primavera regularly that is similar to this but the lemon just sounds like the perfect addition! I love the idea of a primavera! More veggies! ya us food weirdo’s have to stick together! Thanks for the nice comment! I love quick one-pot dinners for weekday nights – so easy to get a hot meal on the table at the end of a long day! Thanks for the tip to toast the orzo before cooking, I bet it adds an extra layer of awesomeness to the whole dish! My daughter loves anything with shrimp and the fact that this is quick and easy to make means I can make it! LOL! Looks delicious, thanks! Thank you for the nice comment Kristine! I love seafood and shrimp is #1 on the list. 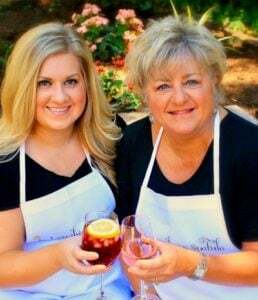 Your pictures make me want to grab a spoon and grab some to taste! So simple and quick yet just perfect for a meal. Thank you for the nice comment! I love your blog BTW!!! I’m a regular visitor!